Yasakusa, Japan. 22nd November 2014. My journey from the mountain to the sea was straightforward and good fun. After my ride through the national park, with its great views of Mount Fuji,the road took me down to the coast. On a lovely, sunny Saturday there were loads of bikes out and I even got a few of my waves returned. Very rare in Japan. The road which bypassed the towns ran alongside the sea and was a real pleasure to be on. At one point I came up behind a guy riding an old Harley. He gave me a lesson on how to get through the traffic, Japan style. It seems that going up the inside of queues is the way to do it. Until that is, you get spotted by a copper! My Harley riding compatriot had turned off and the policeman was waiting the other side of the junction. He waved me in and asked me if I spoke Japanese. When I said no, he mustered up his best English and said something about keeping in the lane. I agreed to do so and he told me to ‘Safely ride’. I said I would and off I went. Phew! The feeling that I had got away with it didn’t last long. I pulled up at a 7-11 for a coffee and when I came out the front tyre was flat. But all was not lost as there was a bike shop on the other side of the street. I went over there and managed to get the young guy to understand that I wanted my puncture repaired and also that it needed doing straight away if possible. They were happy to oblige and got stuck in. I asked them about fitting a new tube but they didn’t have one, being a shop that mostly dealt with scooters. The repair was completed in short order and I carried on, 3,000 Yen poorer. Ouch! Still, instant service on a Saturday is always going to cost. Once in Yasakusa I rang up Sae’s Dad and he insisted I meet him at the station. Once I was there I could see why as I had to push my bike across a pedestrian only level crossing and along the pavement to their apartment block. It was the easiest way to get there from a practical point of view. With my bike tucked around the back and a notice on it to confirm it was meant to be there, I was taken up to their 11th floor apartment, which overlooks the bay. Yasakusa is a naval town. 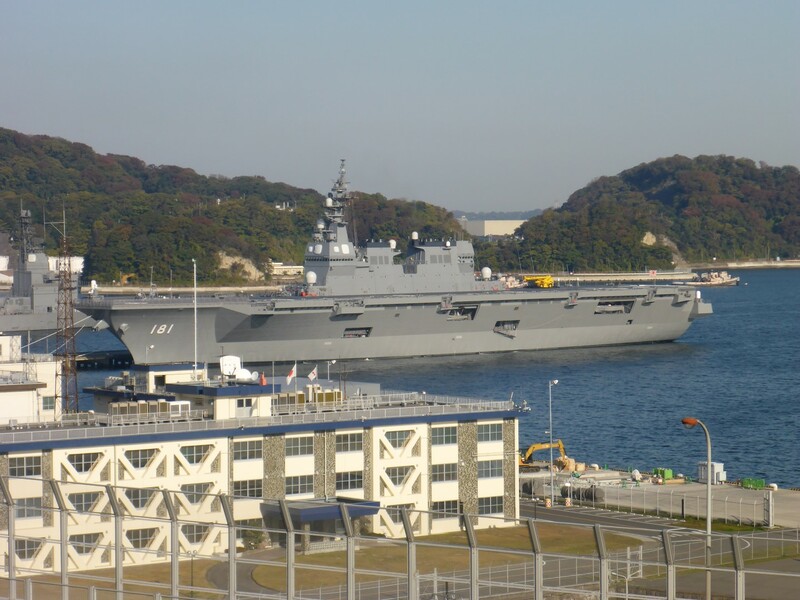 It houses both Japanese and American bases and there is close cooperation between the two navies. 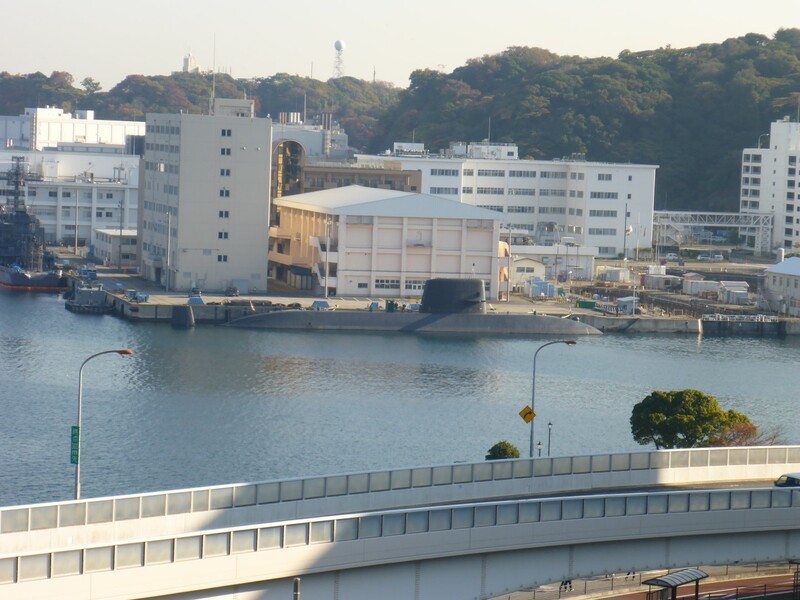 From the apartment window I could see American ships and Japanese submarines. Way out in the distance was a container port. 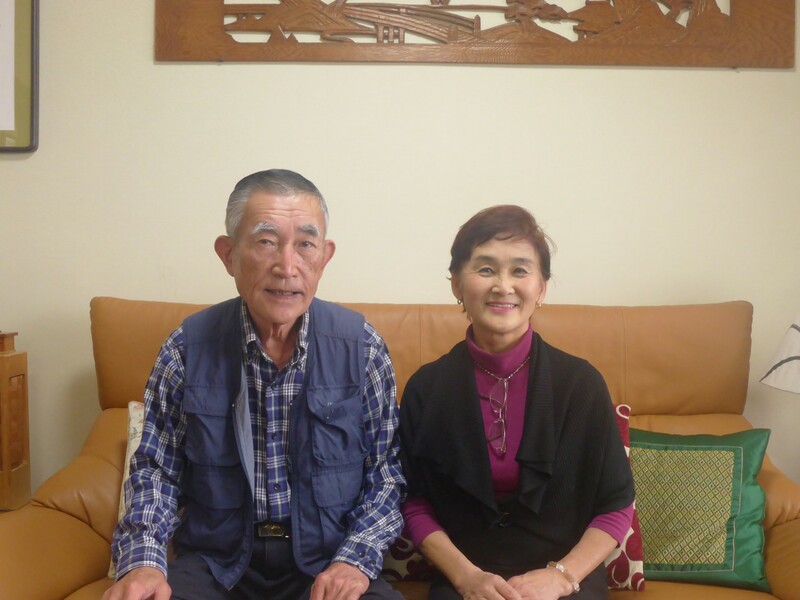 Sae’s Dad, Mitsunori-San, started his career in the navy as an officer cadet and by the time he retired was a Vice Admiral in the submarine fleet. I asked him if he missed his work and he said absolutely not. By the time he retired he’d had enough of the pressure and the politics. Despite having an apartment which enables him to keep and eye on what’s going on, he’s not a lonely old salt missing the sea. For a start, he’s too busy. He’s President of the local Rotary club and is also on the committee which runs the Togo Shrine. More on that later. Japanese sub moored opposite the US ship. Just as well they’re friends these days! Sae’s Mum, Sadako-San, currently keeps herself busy by running doll making classes for American Navy Officer’s wives. It’s a craft she’s very good at, judging by the examples in their apartment, and she says it keeps her busy, helps her practice her English and she then helps the ladies learn some Japanese. 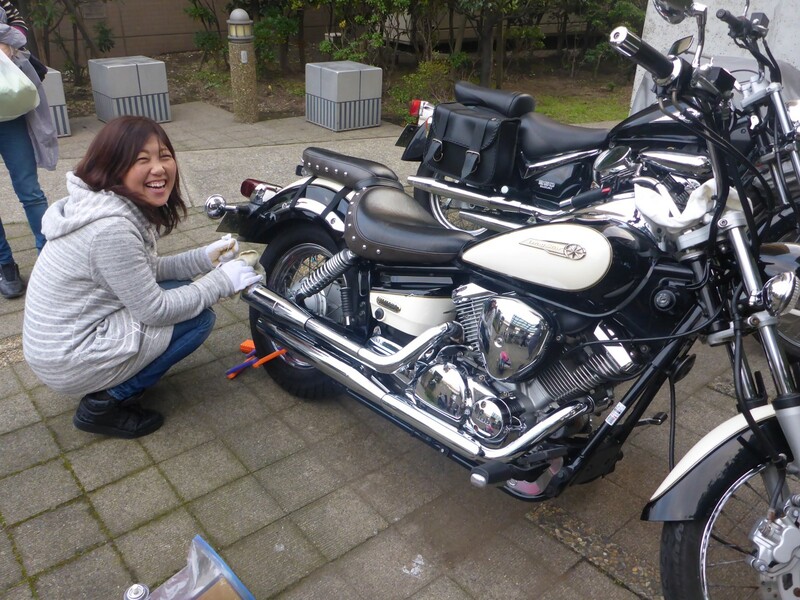 She and Mitsunori-San both speak good English, which made my time there very enjoyable and interesting. For dinner that evening I sampled another traditional Japanese dish, Suki Yaki. This was cooked at the table by Mitsunori-San, which seems to be the tradition. It consists of thin strips of beef cooked in a wok type frying pan over a small gas stove. In went Soy Sauce, juice of some kind (possibly wine), mushrooms, vegetables and lots of what I though was salt but thankfully turned out to be sugar. It was delicious and I was happy to eat plenty of it, with my chopsticks of course. They were quite impressed that I had my name engraved on them too. We had been watching Sumo Wrestling on the TV earlier and Mitsunori-San printed off some information for me to read. It was from this that I learned all about the way wrestlers are trained and how they achieve their ranking. The sport has its roots in combat but became more of a ritual and then a sport in the Edo period.It is also related to ancient Shinto rituals. It only takes place in Japan although many wrestlers come from Mongolia and Korea. So far so Asian but currently one of the best wrestlers is actually Bulgarian. 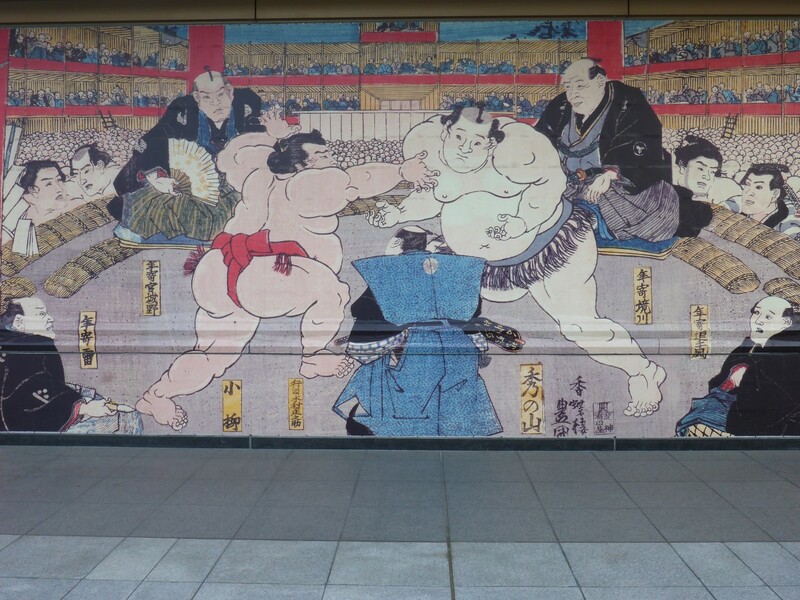 The wall outside the Sumo Museum. The national Championship takes place in a stadium in Tokyo, next to the Sumo museum that I visited. It runs for fifteen days and the wrestler who wins the most bouts wins the tournament. There are six divisions of professional wrestlers and the higher the wrestler sits, the more pay they get. They all belong to stables and take Sumo names. They have to grow their hair so it can be formed into a topknot and they must wear traditional Japanese clothes in public. Like many sportsman they have their fans and detractors. The bout is won by whichever wrestler forces his opponent to either step out of the ring or to touch the ground with any part of his body other than the sole of his foot. Bouts are usually over quite quickly but can go on for several minutes. As the competition progresses towards the final stages the wrestlers are more evenly matched and bouts do take much longer. There are even rules about breaks being taken during the bout, something I was surprised to learn given how quickly they seem to finish. There is a huge amount of ritual attached to the sport and this is most obvious while the wrestlers are in the ring. All the crouching, stamping and salt throwing has ancient origins although some of the crouching down then getting up again is simply due to nerves, or maybe gamesmanship. In any event, neither of the wrestlers can launch themselves at their opponent until they have both crouched down with both hands touching the floor. There’s lots more info on Wikipedia if you’re interested in seeking it out. So learning all this made watching it on the TV much more interesting. I was enjoying the intricacies of it all and I even picked a favourite whom I wanted to win the championship. He didn’t, sadly. Sunday 23rd November is Thanksgiving in Japan and is a very important day in the calender. Possibly the most important. It is correctly called Niinamesai, literally “Celebrations of the First Taste” and part of a series of Asian harvest rites. Officially, it is the day the Emperor makes the season’s first offering of rice crop to the deities. The ritual is one of the most important for the Emperor and is the most important in the Shinto religion, since the Emperor’s gesture displays gratitude for a good crop on behalf of the entire population. 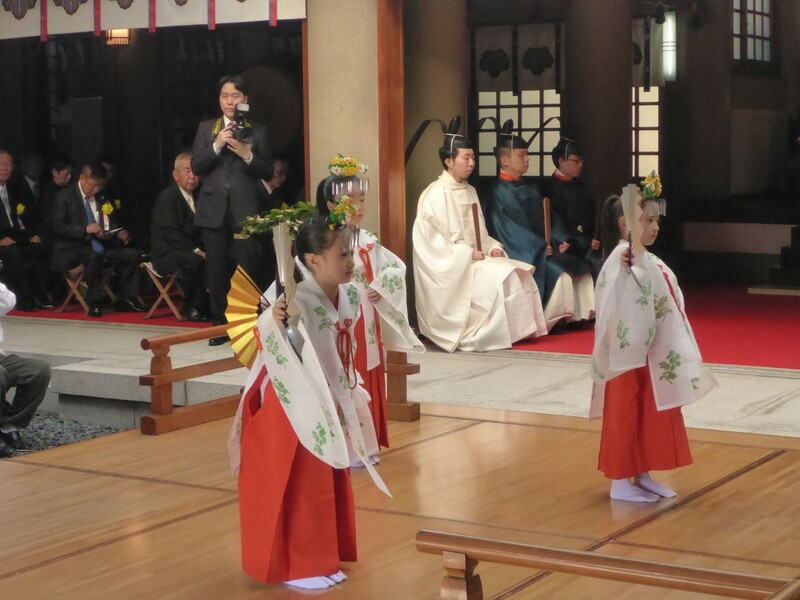 Even in 21st-century Japan, the Niinamesai ritual remains important. It is also known as Labour Thanksgiving Day and is a national public holiday. Mitsunori-San is one of the senior officials of the Togo Shrine, which is in Tokyo. It is dedicated to Admiral Togo. More about him later. Three different trains took us to the nearest station and when we got there I was introduced to some of his colleagues, one of whom is eighty eight but only looks seventy. Japanese people age very well. 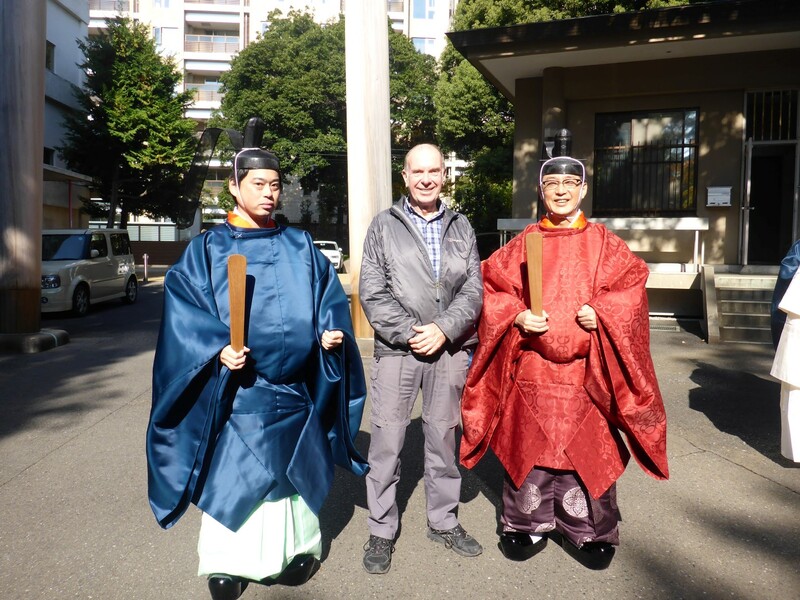 On the way into the shrine I saw some priests so had a photo taken. Once inside we joined other guests in the seats at the side. In the centre of the room were two rows of priests, sat opposite each other. Further inside the shrine was another priest who’s job was to receive the offerings. Proceedings started at 11am when a Master of Ceremonies spoke. When he’d finished everyone stood up and bowed. This was repeated several times. Eventually the offerings were carried in – some uncooked and some cooked rice, fruit and vegetables, a bird etc. The representatives of the different branches of the Togo Association, including Mitsunori-San were sat in rows further inside the shrine. In turn, each of them made their offering by taking something from the priest and going up to the back of the shrine to present it. The guests of each representative, including me, stood up and followed the bow, bow, clap, clap, bow procedure at the same time as he did. This happened a dozen or more times. Mitsunori-San offered some leaves from the Sakaki Tree, which has significance in the Shinto religion as part of the creation story. Dancing girls in the shrine. Once all the offerings had been made we enjoyed watching a dance by three young girls wearing Japanese costume and holding fans. Once that was over we went back outside and were given a drink made from Sake and some kind of thick milk. We also received a very high quality Bento box (a Japanese lunch box). We went back to the office and had some green tea. I chatted with the older guy I mentioned earlier about my journey. He seemed very interested and asked my plenty of questions about the places I’d been to. Definitely time for lunch and we found a nice Ramnen bar before we headed back to the station. The streets around this area are full of fashion shops and were very busy on this sunny Sunday. Togo Jinja, with its trees and peaceful gardens, is something of an oasis here. 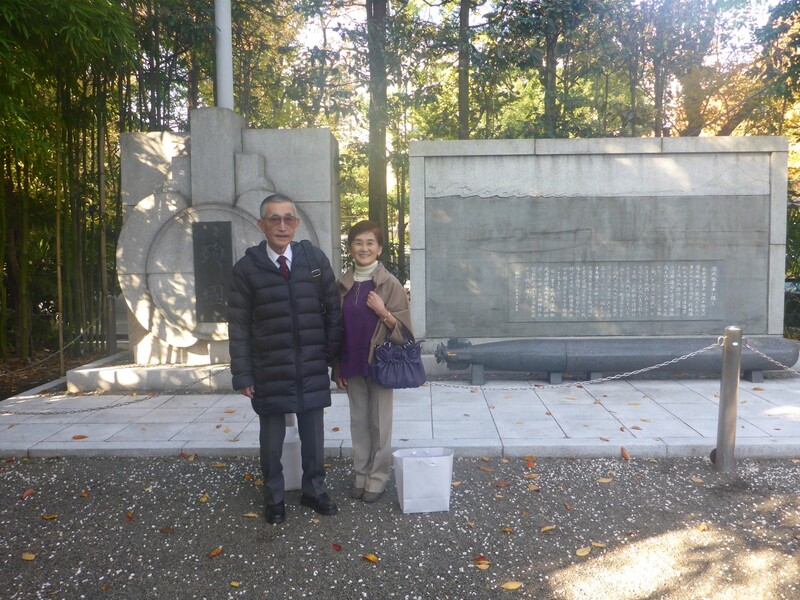 Mitsunori-San and Sadako-San standing in front of the Admiral Togo memorial. Once back at home we spent the afternoon watching Sumo. It was the last day of the Championship and the contestants were much more evenly matched than yesterday. Bouts were lasting minutes, rather than seconds, as the wrestlers undertook plenty of ritualistic salt throwing, stamping and squatting down. Then they’d stand up and do it all again. The actual fighting was longer too. Sadako-San explained some of the finer points to me and I slowly got into the whole thing. My favourite was the Bulgarian I mentioned previously but unfortunately he was knocked out. Pushed out, to be precise. We ate some food from the Bento boxes for our evening meal and I even tried the Sake. Yes, I know – very naughty of me. It had been a very busy learning day for me, with two very important strands of Japanese culture coming at me full strength. I’d really enjoyed it all. 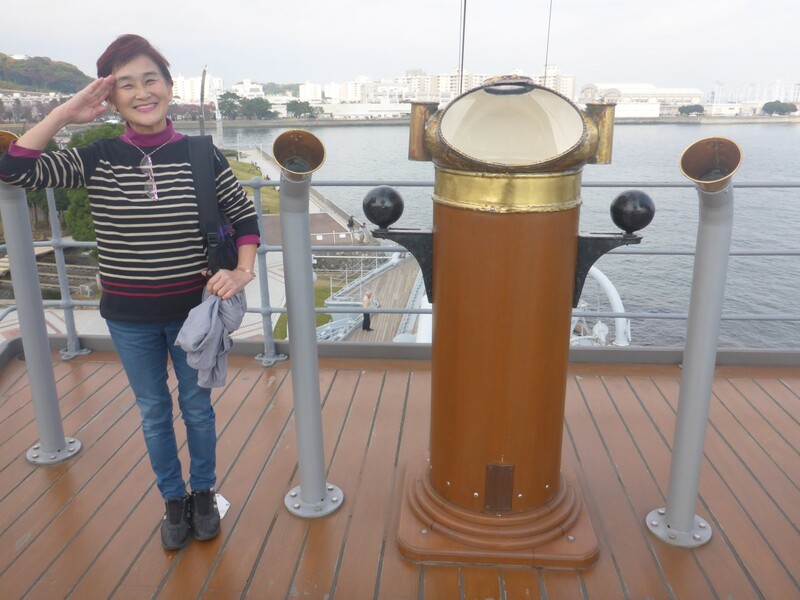 In the morning we all went out to visit the Japanese Battleship Mikasa. It was in dry dock nearby and it was here that I learned all about Admiral Marquis Togo Heihachiro, to give him his full name. His fame and renown comes from a sea battle against the Russians in 1904 and the Mikasa was his flagship. 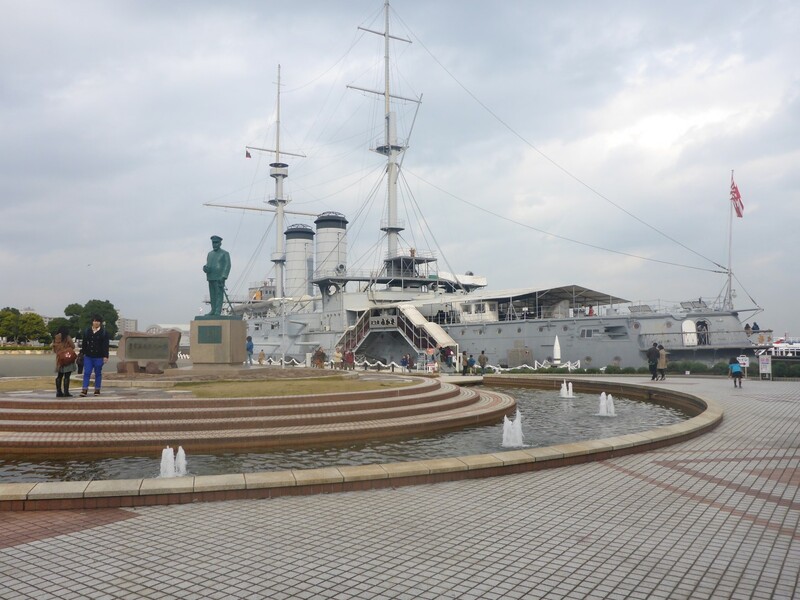 It is easily Japan’s most famous ship. Togo memorial with the Mikasa behind. Admiral Togo was a very interesting man. As an apprentice officer he studied naval science in England for seven years in the 1870’s and sailed around the world on a British ship as an ordinary seaman. The Japanese and British navies were very close at that time and Japan ordered three ships form Britain. Togo sailed back to Japan at the end of this training on one of them. He was appointed captain of several different ships and saw action in the Sino-Japanese war of 1894-5. He was appointed Commander-in-Chief of the combined fleet of the Japanese Navy in 1903. A painting of Admiral Togo during his most famous battle. The Russo-Japanese War took place in 1904-5 and this is were he really made his name. He defeated and trapped the Russian Pacific Fleet in Port Arthur (China) and when the Russian Baltic fleet arrived, having sailed halfway around the world, he destroyed them for good measure. These defeats led to events in Russia which brought on the revolution. The Togo Shrine was built after his death to honour him. Our guide. Kouka, on the left. 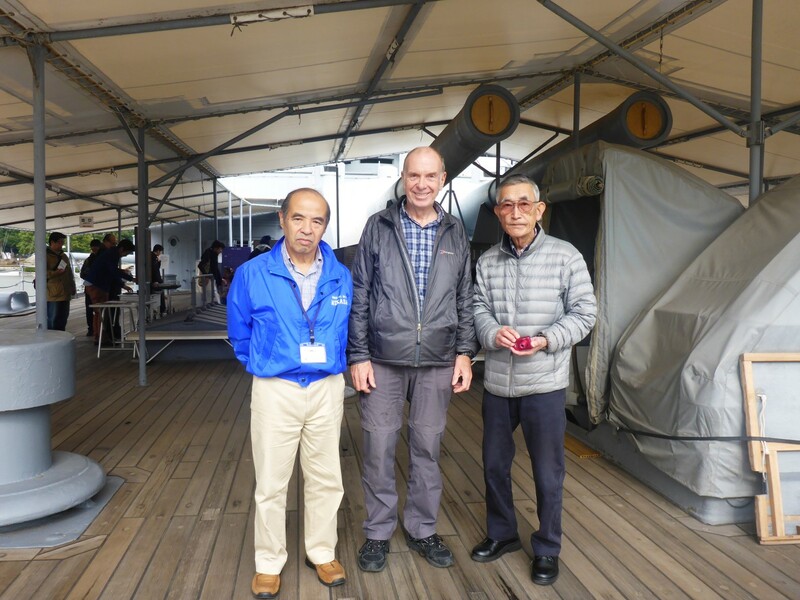 When we got to the Mikasa we were given a tour round by Kouta, one of the official guides. He is a former submariner and served under Mitsunori-San, so I think we got some special treatment. Here’s some things I learnt. The ship was built by Vickers in the UK. 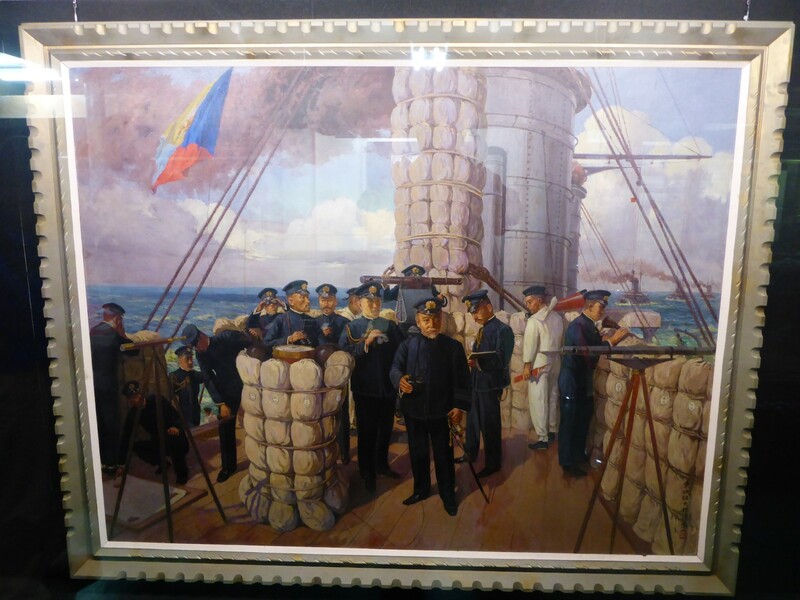 Admiral Togo spent the whole of the Battle of the Yellow Sea in the Conning Room of the ship. It looked like great leadership, putting himself in the firing line, but the actual reason was that he was very short and struggled to see over the instruments on the bridge. The Japanese gunners could score a strike rate of 10%, a real achievement when the Russian navy was at 3-4% and the British at 6%. I queried this, struggling to believe what it implied: 90% or more of shells fired missed their target. Incredible! But it’s just the way was with long range gunnery at sea in those days. The Japanese were so good because of constant practice, something that Togo insisted on. The ship suffered an on board explosion in the 1920’s, caused by some sailors deciding the powder magazine was a good place to brew some alcohol! Their fire blew it up. 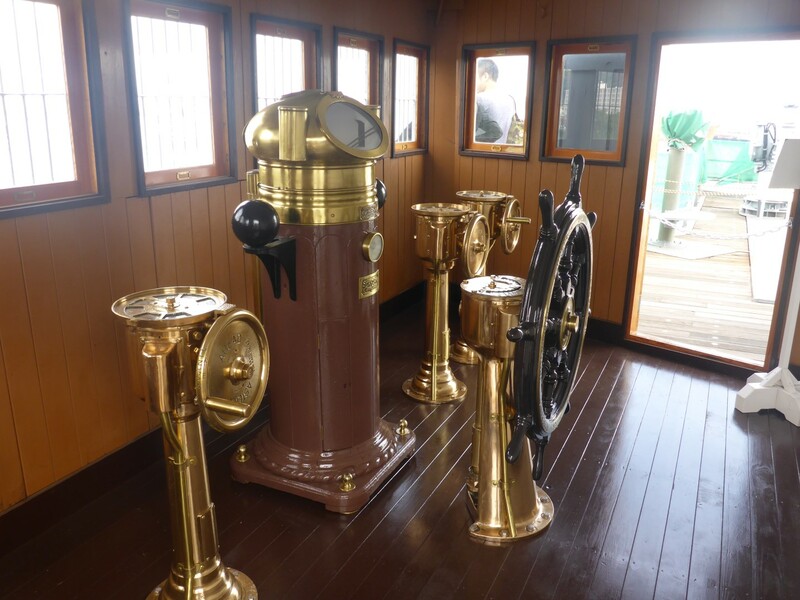 The ship was re-floated and then put into dry dock as a historic monument. At the end of WW2 the Russians wanted it destroyed but the Americans said no. As a compromise the superstructure was removed and subsequently destroyed. What’s on there now was remade for display purposes. I really enjoyed our tour and I learned a lot about some history that doesn’t often cross the bows of Europeans. It’s easy to see why the Japanese are so proud of the Mikasa and of Admiral Togo. The bridge of the Mikasa. I was pleased to be able to treat us all to a Sushi lunch and was thoroughly entertained by the whole process. I’d already discovered how good the Japanese are at making food delivery simple but a Sushi restaurant takes it to a whole new level. The food comes along on a conveyor belt next to the table. You take a dish, eat it and put the empty plate down a chute. Each plate is the same price so they count plates to know what has been eaten at the table. You can order extra dishes by selecting from a menu and pushing a button. It comes along the conveyor belt which stops by your table so you can take it off. Hot water, cups and green tea are at the table too, just help yourself. When you’ve finished you press a button and your tally card is brought to you. Pay at the till on the way out. So simple. Back at the apartment block we got out of the car, Mitsunori-San pressed some buttons at the car park entrance, drove his car onto a platform and we walked away. 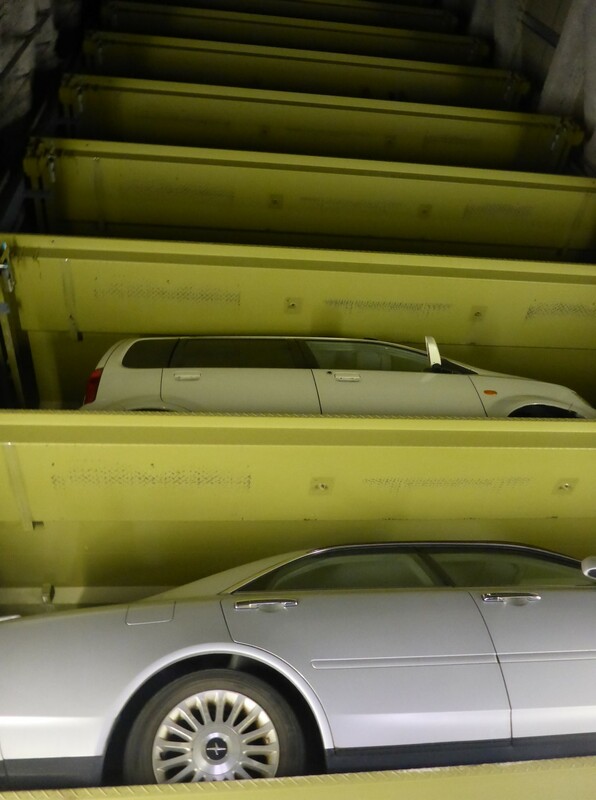 The machinery took the car and parked it somewhere up above. Fantastic. Local biker doing her Sunday chores. For dinner we had Tempra, another dish cooked at the table. This consists of small pieces of fish, meat and vegetable dipped in a light batter and deep fried in ‘salad oil’ I didn’t find out what plant it was from but it was very nice. Rain greeted me next morning, I was in for a wet ride. Before I left I went and visited Sadako-San’s collection of American Naval Wives who came to make Japanese Dolls. They were very friendly and I ended up giving them an impromptu presentation about who I was and where I’d been. In turn I looked at what they were doing and learned a little about how to make the dolls. I must admit I had been very nervous about meeting Sae’s parents. I’m not really sure why. I’d met them before when they came to London for her wedding but this time I was on unfamiliar territory so maybe that was the reason. But I needn’t have worried. I am delighted to say that they are both wonderful people and welcomed me with open arms. We seemed to get on very well together and talked about all sorts of different things. They have great senses of humour too. I was delighted to have been able to learn so much at their hands and was honoured to have been invited to the ceremony at the Togo Jinja. They put themselves out to make me feel welcome and I am very grateful to them both, and to Sae for arranging the visit. The highlight of my trip so far. Next? Hamamatsu, and Japanese culture of a completely different kind.